A park in west London has remained sealed off after police searching for Alice Gross murder suspect Arnis Zalkalns discovered a body in dense woodland. Boston Manor Park, which includes the M4 flyover at the Brentford end of the park, remains closed after today's discovery of a body. The park, which is around a mile from the site where Alice Gross was found, includes a nature trail, children's playground and cafe. 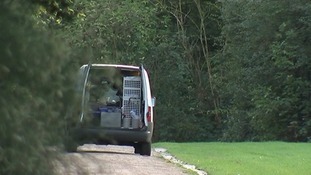 A forensics van could be seen with its back doors open after the park was closed this afternoon. Police stood guard at all the entrances to the large park, and told people wanting to enter that it was closed.